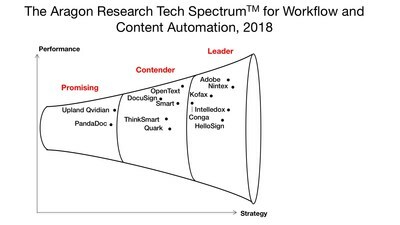 BELLEVUE, Wash., Aug. 2, 2018 /PRNewswire/ -- Nintex today announced that the company has been named a Leader in the Aragon Research Tech Spectrum™ for Workflow and Content Automation, 2018: The Document Revolution based on an evaluation of 13 platform vendors who are leading the market. To download a complimentary copy of Aragon's latest visual research report, go to www.nintex.com/TechSpectrum2018. Aragon Research CEO Jim Lundy defines WCA as a new category of content that focuses on automating document processes and transactions that involve people. Aragon predicts that, "by year end 2020, 65 percent of enterprises will have re-architected their document processes with a focus on automated creation and routing.1"
Aragon believes that enterprises should take advantage of WCA platforms to automate workflows and produce intelligent documents, leveraging process analytics to accelerate productivity with intelligence. Additionally, the firm has identified top reasons business leaders should care about these types of platforms including: accelerated revenue, improved accuracy, improved profitability, enhanced customer experience, reduced risk and operational improvement. "Keeping document processes fully digital is part of the challenge in an overall digital transformation approach," said Lundy. "The new battle cry is to automate the process of creation, routing and completing the document based transaction – as a pioneer in this market, Nintex is one of the leaders to watch." Nintex is recognized for its early and continued leadership in WCA within Aragon's latest report. Every day IT professionals and line of business owners turn to the Nintex Platform to leverage advanced workflow automation, document generation, mobile apps, modern forms, and process intelligence – which expedites organizations move toward aggregate operational productivity and process excellence. The company continues to innovate and expand its process automation capabilities. On July 31, 2018 Nintex announced that it has acquired Promapp, the market leading visual process mapping solution from New Zealand that has achieved business process management leadership by helping more than 500 public and private sector organizations worldwide successfully map and manage their processes realizing process improvements through intuitive, powerful tools used by teams every day. The combination of Nintex and Promapp brings together two powerful, cloud-based technologies to quickly automate, orchestrate and optimize business processes from the back to the front-office, easily connecting people and integrating with the world's leading business ecosystems and apps. Aragon has recognized both Nintex and Promapp as Hot Vendors for being visionaries and innovators in their respective categories. To learn more visit, https://www.nintex.com/workflow-automation/process-mapping/. 1Aragon Research "The Aragon Research Tech Spectrum™ for WCA 2018" by Jim Lundy, August 2018.